It is the ultimate boss; the brain rules all your actions, thoughts, and feelings. In spite of its importance, we know the boss very little. Scientists today are deeply involved in brain research; it's one of the hottest research topics of the 21st Century! Meet 12-year-old Mark and discover what happens in his brain when he learns math at school, when he speaks and listens, when he gets stressed out or in pain, and when he sleeps. 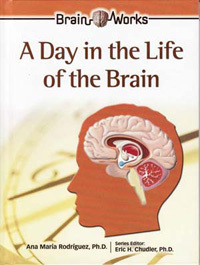 Mark will also show you myths and facts about the brain and activities to keep it sharp all your life.